Play Mobile Bingo Pay by Phone Bill @ Tea Time Bingo! 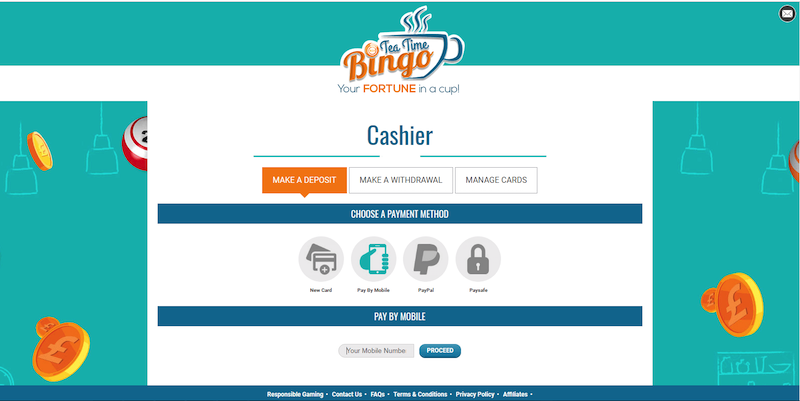 Pay by phone bill bingo sites are becoming a lot more popular recently and here at Tea Time Bingo, we pride ourselves on providing this service for our players. If you aren’t quite sure what pay by phone bill is or how it works, then don’t worry because we are going to tell you all about it. Keep reading to find out more about this great new payment method. What Are Phone Bill Payments? A phone bill payment allows you to make a deposit in no time at all using your mobile phone bill. Pay by phone bingo will take your phone number and then add any deposits that you make to your final monthly bill. This means that you don’t have to worry about paying right away – you can get straight to it and be winning big in no time at all! How Do You Make Phone Bill Payments On TTB? Mobile Bingo Pay by Phone Bill on Tea Time Bingo is really easy, and we know that you’ll understand it perfectly once you get started. All you need to do is go to the banking section of the site where you normally make a deposit. Then, you can enter your mobile phone number to the site that you want to use as the payment method and the rest is simple! There a few ways that you can make a deposit using mobile bingo pay with phone bill. This includes Boku and Payforit. Boku Bingo is a safe method of doing this and you don’t need to enter any details of your credit card or bank account to make use of it. Another method of pay by phone bill is Payforit which works in a similar way. Both of these methods work great for making a deposit to pay by phone mobile bingo sites like Tea Time Bingo. There are so many benefits to using this payment method to deposit on your favourite online bingo site and many people are taking advantage of them. When you use pay by phone bill, you don’t need to worry about any service charge and there are often low deposit limits. On top of this, pay by phone bill bingo sites are very secure as you don’t need to enter any of your personal bank details. You can start playing your favourite games quickly without any hassle of having to grab your wallet! Of course, as with any payment method, there are some concerns that come with pay by phone bill casinos. When you use this service, you cannot withdraw as it is a one-way system. You also might risk forfeiting your welcome offer. There are some concerns over how easy it is to deposit more than you can afford, but methods like Boku and Payforit allow you to set your own limits. While there are some disadvantages to using pay by phone bill, it is a much more secure and easy way to pay. You can play then play and worry about the bill at the end of the month! There are many other payment methods including vouchers like PaySafeCard and e-wallets like PayPal, but these methods still require you to pay right away. Avoid this and pay when your phone bill comes out with this quick and easy method at Tea Time Bingo! When you are gambling online, it is really important that you read any terms and conditions to make sure that you are in the know about where your cash is going. Some operators might have terms and conditions that apply to your phone bill payments meaning that you don’t get your welcome bonus, or you can’t withdraw with that method. Your phone carrier might also have some terms that you’ll need to know about to use this service. Get in contact with them before signing up to make sure that there won’t be any extra charges added. The middleman might have an effect on how simple this process is but as long as you know what you are doing – this process should be as simple as it seems! Mobile Bingo Pay by Phone Bill sites like Tea Time Bingo are perfect for those who want to play then pay. This service is incredibly simple to use, all you need to do is add your mobile phone number and you’ll be billed for any deposits at the end of the month. Try out pay by phone bill bingo on our site and you’ll love this new payment method!